Space weapon law: U.S., China, and Russia developing dangerous dual-use spacecraft. Russia, China, and the United States are developing “dual use” technologies. One use is peaceful. The other isn’t. Photo illustration by Juliana Jiménez Jaramillo. 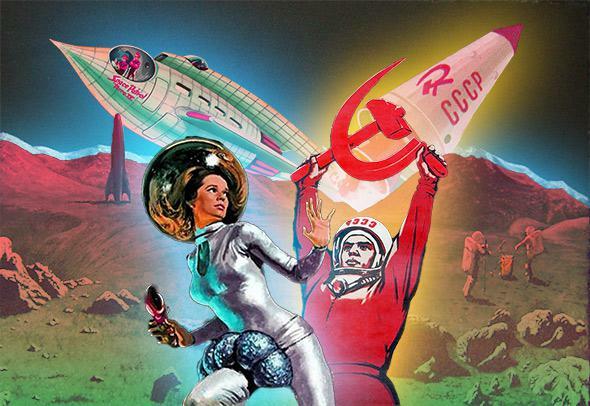 Soviet space propaganda of the ’50s and ’60s. When Russia launched into space an object known as 2014-28E in May, no one batted an eye. The object was part of a communications satellite launch, and experts wrote it off as rocket debris. But in November, 2014-28E showed off some fancy maneuvers, like going into a new orbit and reconnecting with the rocket stage that launched it. Russia has kept silent about the spacecraft—it didn’t announce its launch, and officials have not responded to inquiries about its purpose. Given the historically fraught relationship between Russia and the United States, experts are warily speculating about what 2014-28E is meant to do. Is it a weapon? Or are Russians just using it to test new technologies to build better spacecraft? This isn’t a dichotomy: It could be both. “Almost everything we put in space is dual-use—you can use it for a good or malignant purpose,” says Michael Listner, founder of the consulting group Space Law and Policy Solutions. One example is NASA’s Robotic Refueling Mission. As its name implies, the project launched technology to refuel satellites. Seems innocuous enough, but to other nations, the RRM could be viewed as a potential space weapon development mission. “If you can bring new fuel to a satellite, you could also go up and do bad things to other satellites: move them, eavesdrop on all the data, change the purpose of their satellite, or grab and deorbit it,” says Steve Mirmina, professor of space law at Georgetown University. It’s difficult—if not impossible—to determine what counts as a space weapon. Identifying space weapons has become a psychological game: Experts must infer the intentions of the nation launching space objects. In the case of 2014-28E, Russia could be developing nondefense space tools, like NASA’s RRM; it could be beefing up its ability to create weapons; or this could all just be a ploy to flex its military muscles and keep other space-faring nations wondering. It’s a high-stakes international bluffing contest where tensions can mount quickly. The vagueness of what makes a weapon a weapon means that it is difficult to regulate their creation. The only hard rules on space weapons were set forth in the 1967 Outer Space Treaty, initially signed by the United States, United Kingdom, and former Soviet Union and now signed by about 100 nations. It holds that nations should strive to use outer space for “peaceful purposes” and may not launch nuclear weapons or other weapons of mass destruction in orbit around the Earth, on the moon, or toward any other celestial body. Attempts to beef up the rules have not been successful. Russia and China have drafted multiple versions of a treaty called, exhaustively, the Treaty on Prevention of the Placement of Weapons in Outer Space and of the Threat or Use of Force Against Outer Space Objects, but the United States’ U.N. delegate voted against it in 2008, calling the treaty “a diplomatic ploy by [Russia and China] to gain a military advantage.” When Russia and China submitted a revised version this summer, the U.S. rejected it again, this time saying the treaty doesn’t adequately define its terms and doesn’t effectively prevent the full range of possible weapons. One of the treaty’s glaring omissions, critics say, is that it ignores the fact that space weapons don’t need to be in space to do harm. Weapons designed to destroy objects in space or otherwise wreak havoc can be stored and deployed from the ground. Most chillingly, this technology is already in place: China launched a powerful and precise ground-based missile in 2007 to destroy one of its decommissioned satellites. This aggressive display showed that ground-to-space weapons can effectively destroy orbiting targets and that the dangerous, uncontrolled debris it generates can cause collateral damage by colliding into other space objects. Politics play into the U.S. rejection of the treaty, too. For Russia or China, putting forth a treaty that slows down the United States’ assertive space activities is a plus—it potentially gives other countries a chance to catch up. From the United States’ perspective, though, such a treaty could squash the country’s technical dominance. “You don’t want to be constrained if you’re in the lead,” says Freese. Recognizing the potential for escalation, several international groups have been working to reduce tensions through open communication and transparency initiatives. The European Union laid out a Code of Conduct for Outer Space Activities, a legally nonbinding, “rules of the road” for space. Space, like open water, is not owned by any country, and so space law takes some legal precedent from maritime law. “When two ships pass at sea, they do it at a certain distance, or else you can infer nefarious intent,” explains Freese. Similarly, the CCOSA suggests nations play nice with one another and maintain open lines of communication to show good will, such as publically announcing their space launches and notifying other countries should their satellites go on the fritz.